What will your invitations say about you? Whether your event is small and intimate, cute and personable, or huge and glamorous, you want your invitation to stand out. You want an invitation that lets who you are shine through. At Iyris Invitations, we take your heart's whispers and gently craft them into elegant one of a kind invitations that do just this - let your personality shine through. You are sure to get an invitation that will do more than speak to you. It will speak for you. 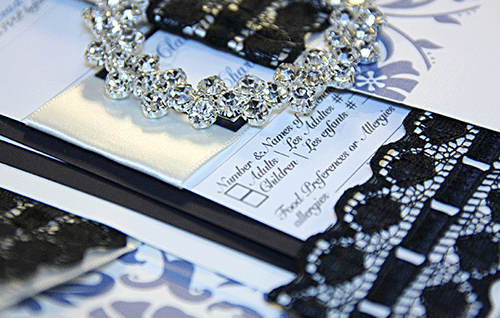 Our hand made invitations are crafted to leave lasting impressions. They will stamp your event with your vision, and brand it with your personality. According to Greek mythology, when the gods needed messages to be sent to fellow gods, they would turn to Iris - the messenger of the gods - for a speedy and fast delivery. They knew that with iris, their message was in the right hands. Following suite, Iyris Invitations' mission is to deliver to you, your heart's whispers, in the most elegant way possible. Your hand made invitations, are brought to life with the help of our skilled artisans, from various artistic backgrounds. With each one of us bringing in a unique set of expertise to your invitations. Thus making your invitation a unique compilation of various points of view. Express your heart's whispers with our whispers invitations. By combining our talents with your vision, we will create for you an invitation to match your unique, individual style, voice, and personality. What whispers will your invitation share with your loved ones? Consider our ecological invitations for invitations that will keep on giving. If your are environmentally conscious, and or just want to give your guests a memorable gift, this is your option; the card that keeps on giving. Try something innovative, try something different. Give your guests an invitation that is sure to stand out. For the digitally connected our electronic invitations are the way to go. Give your guests an invitation that is always accessible to them..